16. Augustus David3 Cox (Joseph2, John1) was born 2 August 1820, in Wayne County, Indiana. He died on 1 September 1885 at Hampton township (Rapids City), Rock Island County, Illinois. Augustus married Rebecca Gillespie on 21 September 1848 in Mercer County, Illinois. Rebecca was born 24 November 1828 in Hart County, Kentucky, and was living in the summer of 1906. Augustus and Rebecca are buried at Hampton cemetery (or Port Byron). In 1850, Augustus was a farmer in Rock Island County with land worth $1000. His mother Mary resided with them. (Dist #37 [probably Hampton], p. 192B). In 1853, George J. Rowe settled on his farm, where Rowe remained for two years (S117, 22 May 1885 & 18 Sep 1885). A. Cox is on the earliest list of members, dating to 1857, of the Methodist Episcopal Church in Port Byron (S20). 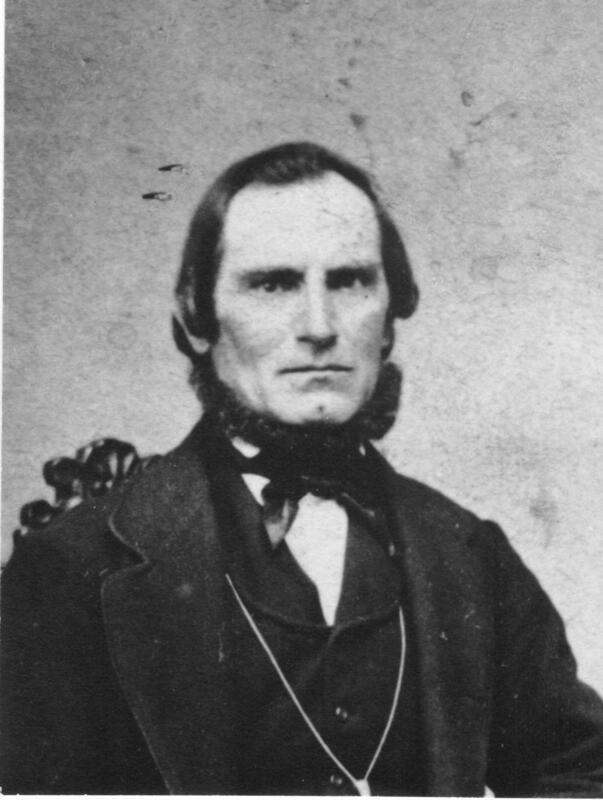 Shortly after the death of his mother in December 1858, Augustus acquired some land in Cedar County, Iowa that proved to be a profitable investment. He bought 160 acres on 5 March 1859 for $1000, of which he sold half on 12 June 1878 for $2,520 and the other half on 23 February 1881 for $2950 (Cedar Co. Deeds P:275; 14:474; 15:465). COX A.D. Farmer and Stock Raiser; sec. 3 [Hampton township]; P.O. Rapids City; born in Wayne Co., Ind., Aug. 24, 1821; left there and went to Tippecanoe Co., Ind., in 1824, and remained there until the spring of 1837; then came to the Co. and is among the oldest settlers; has family four sons and one daughter; lost one son and one daughter; wife was Miss Rebecca Gelispie, born in Hart Co., Ky., Nov. 24, 1828; married Sept. 21, 1848, has 27 [sic] acres of land, value $13,600; Rep; was Supervisor one term, and held other town offices; Meth. An A.D. Cox was mentioned as an officer in Rapids City Lodge #27 as of 29 May 1877 (S122). In 1880, August D. Cox, farmer, with Rebecca, Rossella, Irwin and Ernest Cox, were enumerated in Rapids City (p. 320B). On 28 May 1885, A.D.'s house in Rapids City burned, which house was then occupied by James Hanley (S117, 29 May 1885). Augustus died with substantial lands in Rock Island County, including two house lots in Rapids City, about 75 acres in the NE quarter of §10, township 18 in range 1E ("an ordinary piece of farm land but for want of care & attention has 'run down'"), the east 76.94 acres of SE fractional quarter of §3, T18, R1E (except about 3 acres in RR right of way), the west 33.33 acres of SW fractional quarter in said §3 (except 3.45 acres of RR right of way), and the NW quarter of NW quarter of §10 in that township. The last three tracts were described as 80 acres with a house and barn and 139 acres partly timbered. Augustus's land was valued at $10,065. An inventory of Augustus's personal estate was filed on 11 December 1885 (S15). It included personal property worth $1809.93, $197.90 in cash and several notes, principally $573 owed by Augustus's son Wm. O. Cox, which was described as "good for full amt" and secured by 160 acres in Furnas County, Nebraska. Another $74.05 was owed by John N. Cox (possibly John W. Cox), which was described as in the hands of a collector, but doubtful. By 30 January 1888, the administrator reported $29.75 as collected on these debts and the remainder worthless. Nevertheless, on 6 January 1894, $46 was collected on the John N. Cox note. Augustus's personal property included an old horse ("Dan"), bay horse ("Printer"), span of mules, bay mare ("Fannie"), two year old colt, one year old colt, gray mare ("Sal") & colt, 75 head of sheep, Holstein bull, red cow ("Cherry") & calf, brown cow & calf, brindle heifer, old brindle cow, three red cows, white-faced, & two calves, light red cow & calf, 2 year-old heifers, last spring calf, light red cow, 3 red heifers, 2 two-year-olds, 4 fat hogs, 9 shoats, about 40 tons hay, 19 acres corn, 13a acres corn, wagon, sleigh, hay rack, 2 old hay racks, Eagle harrow, stalk cutter, corn planter, hay rake, hay tedder, plow, corn plow, Buckeye mower, spring wagon, seed sower, old lumber wagon, wagon (run two years), old buggy, sleigh, wagon, spring wagon, old iron, gun, fork & carrier, tools & fixtures, sleigh running gear (wood work only), 1 set harness, 1 set light harness, 4 turkeys, dozen chickens, plow, fanning mill, drag, two pair sleds, car irons, threshing machine, pair steelyards, pair bal. scales, 10 milk cans, churn, crocks & buckets, barrels, washing machine, sewing machine, Bibles & other books, dishes, looking glass & clock, 17 yds parlor carpet, reclining chair, couch, lot of cane bottom chairs, rocking chair, wash stand, 3 lace curtains, 17 yds rag carpet, 17 yds new carpet, 3 feather beds & bedding, cook stove, common table, large table, lounge, 6 old chairs, bureau, cupboard, table, silver-plated ware, knives & forks, cider mill & press. The Moline Daily Dispatch of 17 August 1898 and Port Byron Globe of 19 August 1898 report the death of a Rebecca Cox at the home of her brother in Peoria, Illinois, she having "recently" moved from Rock Island to Springfield She left "3 sons, 2 of whom are in Puerto Rico." However, a Rebecca Cox who appears to be Augustus's wife is in the 1900 census for Hampton township, Rock Island County, as a widow, having had 7 children, 4 of whom were then alive. She was also described as living on 21 September 1904 (S38), and a resident of Rapids City in the summer of 1906 (S84).